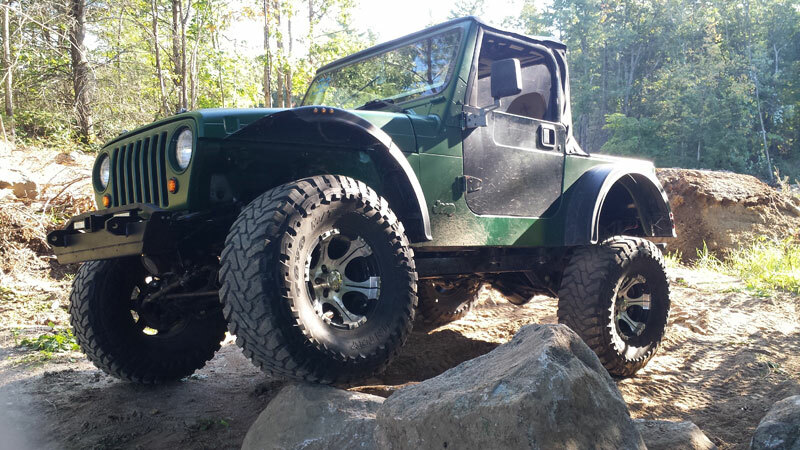 It’s been quite some time since my last post on the Jeep and a lot has happened in that time. Life also happened and with everything going on in my life outside of Jeep’s, some unexpected deadlines, and surprise failures, there wasn’t time it seemed to keep everyone up to date. In fact, those deadlines mentioned even meant I got surprisingly few photos of the Jeep considering how much has been accomplished on it. Now that the Getaway Jeep, tentatively named ‘Oscar’, is on the road, let me catch you up on how it got there. At this point in the build it was the heart of winter in central Ontario, which meant work on the Jeep in the driveway was reserved for pretty select days. Instead, I was working on several different minor projects all over the place as time allowed. 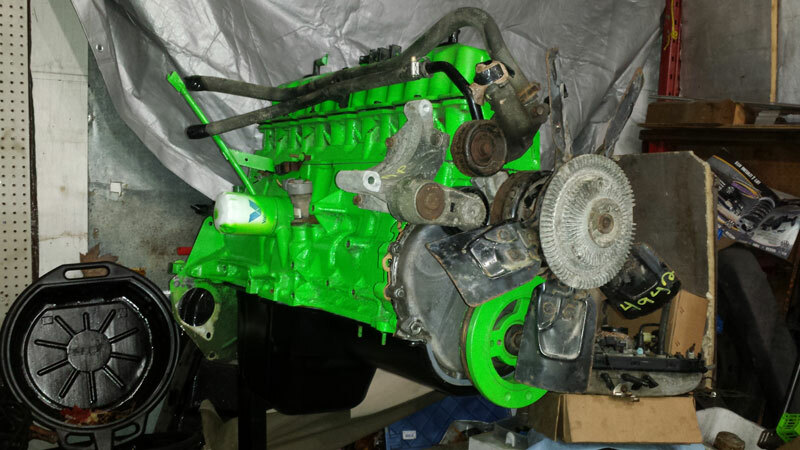 For one, I was at the point where body parts were finally going back on to the Jeep, and that couldn’t happen without a fresh coat of paint. Luckily I had access to some space to convert into a makeshift paint booth and got to work. The paint I chose is actually regular rust paint from the local Home Hardware. Turns out that they can now tint rust paint to any colour of your choosing. 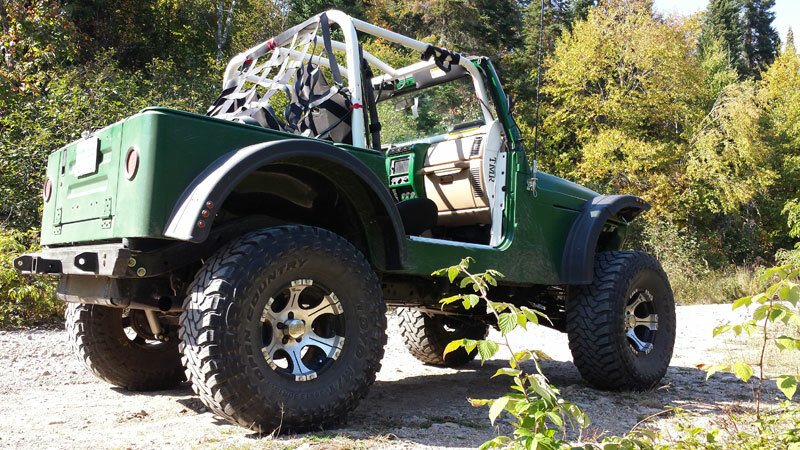 For awhile the Jeep was going to be a brilliant orange, but in the end this shade of green won out. 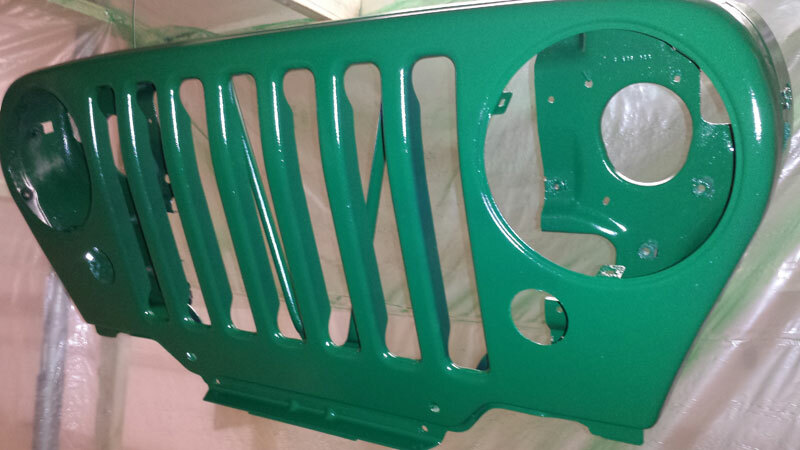 I haven’t put a clear coat on the Jeep yet and probably won’t. Instead I’ll just rely on wax to protect the paint – the theory being that this being regular rust paint, I can just go down to the store and pick up a quart to touch up the paint with a brush when it inevitably gets scratched up. Function over form here. At this point in the build I found myself jumping back and forth between body work and paint. Some of that body work involved some high tech CAD work (Cardboard Aided Design). Anyone familiar with TJ’s knows they are prone to rusting out the front fenders, and mine were no exception. I had four fenders and every one of them had a hole in them. I wanted to solve that problem once and for all as well as do something unique that would give a strong nod back to those classic Kaiser’s and they’re round fenders. 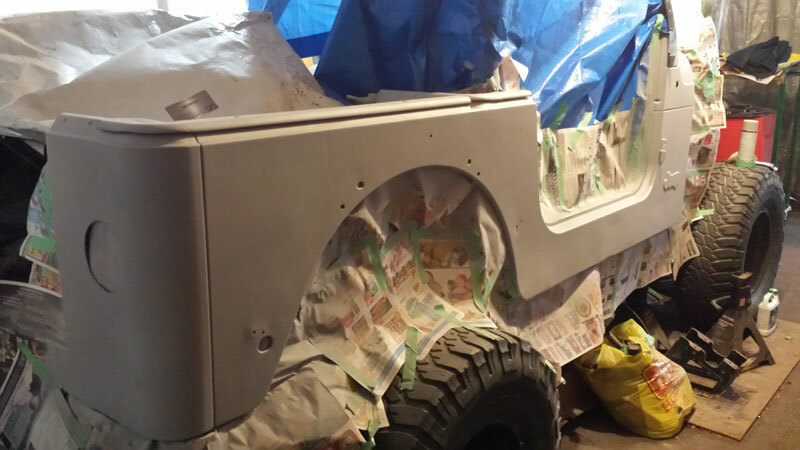 The solution took a lot of time to source and even longer to make work, but the Getaway Jeep now sports round plastic fenders that were originally intended to live over the lift axle of a concrete truck. I set them high on the body to give lots of room for the axles to flex around underneath and gave them stout, but minimal mounting. The advertising for these fenders involves video of running them over with a tank and watching them bounce back in to shape. I figured in that case they could withstand a few hits against the trees, but I didn’t want to mount them too rigidly to hamper that flexibility. Of course I did worry that my minimal mounting might let them flutter on the highway, but thus far that has never been a problem. The rear’s were done to match, but the flat tub side was much easier to mate to than the split and rounded shape of the hood. The front fenders actually split in the middle, with the top half mounted to the hood and flipping open with it giving lots of room to get in next to the engine for repairs. While on the body work front I installed flush mount truck tail lights as I’ve always hated the big boxes on the rear end of Jeeps. I also wanted to make the most of a rather minimal box areas. 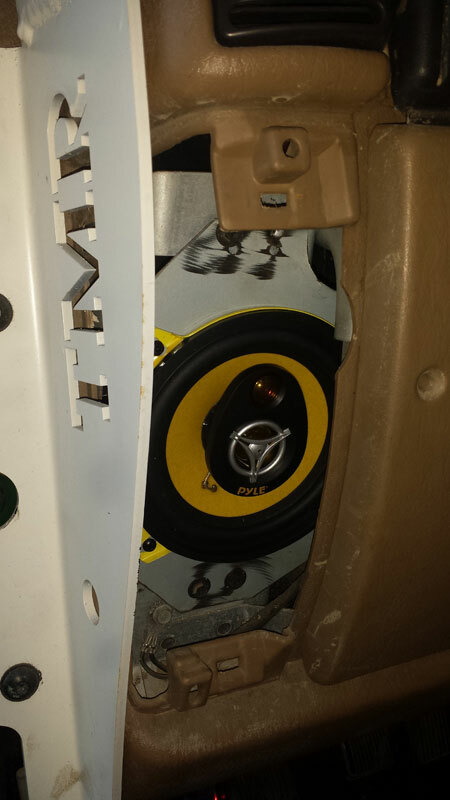 Step one was to turn the standard rear hatch into a drop down tailgate. 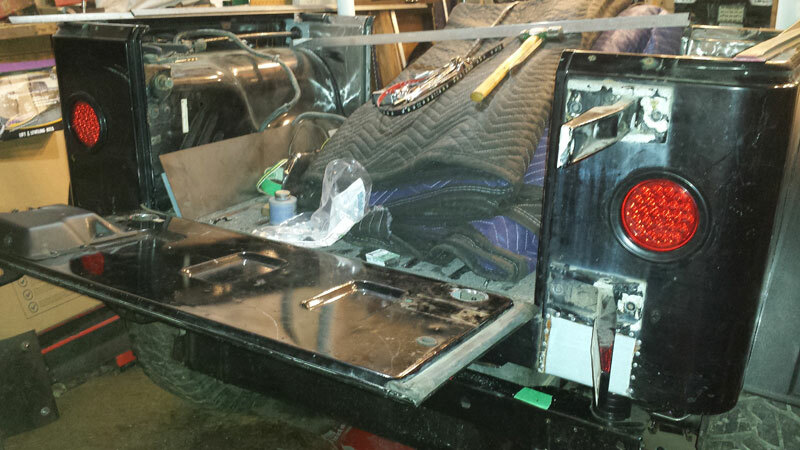 When combined with the spare tire carrier I intend to build, it’s as good as an extra 16″ of bed space. The project turned out to be surprisingly simple. Some good, stout hinges from the hardware store get nut and bolted to the tailgate through a single hole bored on the inside wall, and taped and bolted to the heavy wall angle I had already put into the rear of the tub to rebuild the rotted out body mounts. To make the bed even more flexible, I set the rear of the cab up to be removable, giving me the ability to run long loads right up the passenger foot well when needed. The gate is held in place by pins that were intended to lock house hold patio doors. It gave me a neat and tidy articulated pin that already had a lock built in for extra security (if we ignore that fact that six inches above the soft top is held closed by zippers and velcro). 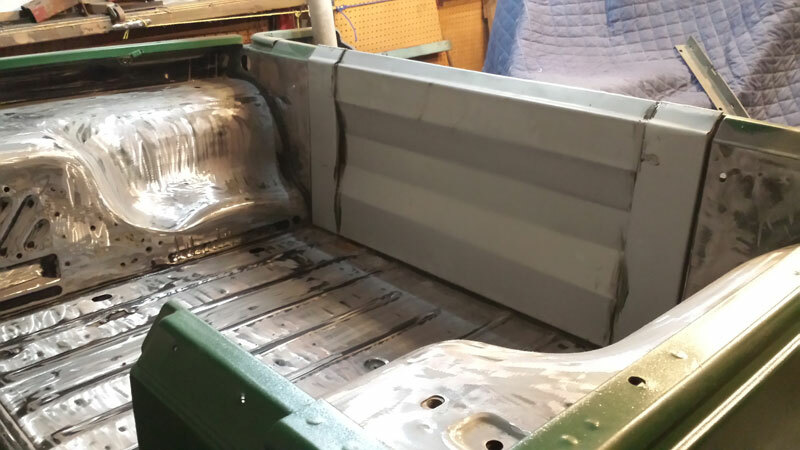 At this point it was time to prep the tub for paint and bedline my freshly built truck bed. Meanwhile, my kitchen table had been pressed in to service as an upholstery shop. 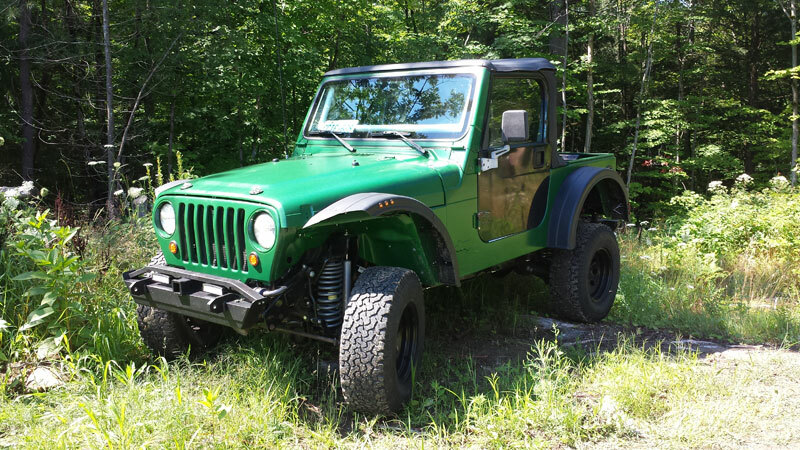 Early in my build I had come across another Jeeper who was looking for a set of original Jeep seats and was offering to trade even for a set of racing buckets he had mounted to Jeep TJ track hardware. 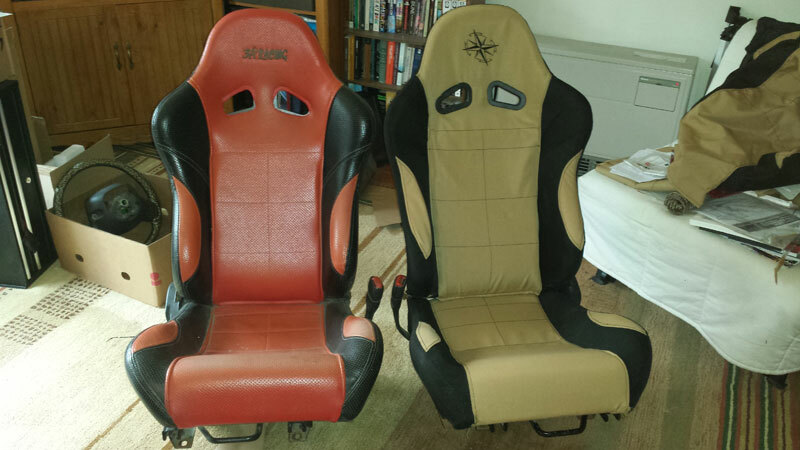 I wasn’t entirely sure if I wanted to use the buckets when I first picked them up, but I did know that I had two complete sets of original seats in very good condition so nothing to lose in making the trade. The only downside was that the seats were bright red and badly faded – they would have looked horrible in my green Jeep. So with a trip to the fabric store for some outdoor furniture fabric and many nights cutting and sewing, I was able to give my new seats a much more becoming facelift. I even had a local shop embroider a compass rose into the headrests to further the Getaway Jeep’s theme and purpose. While at it, I also stitched in a bunch of MOLLE webbing into the seat backs to give me space later on to get organized. I also got down to work with a knife and some epoxy modifying the centre dash console. 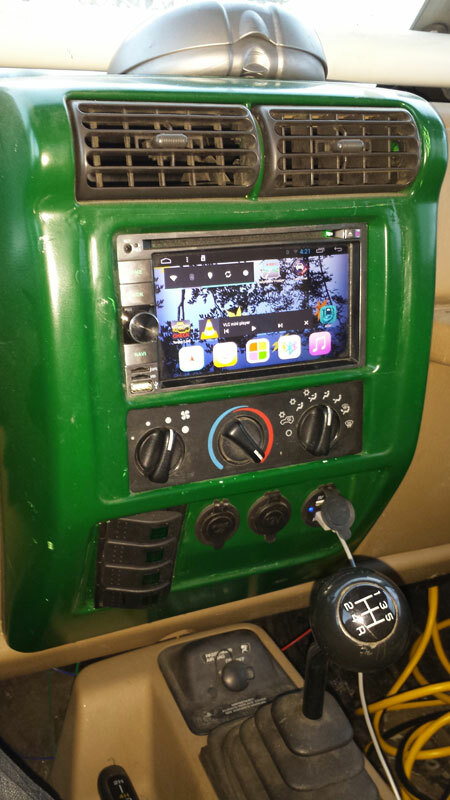 One of the original goals of the Jeep project was to mount a double din android head unit in. To make that happen I had to carve a new hole into the centre console and patch in the face plate from a generic radio mounting kit to return the bevelled, factory like mounting style. While I was at it, I decided to do away with the ashtray and hard top controls I would never use and replace them with a tidy and clean mounting location for accessory light switches and power ports, including USB ports to keep phones charged on the road. 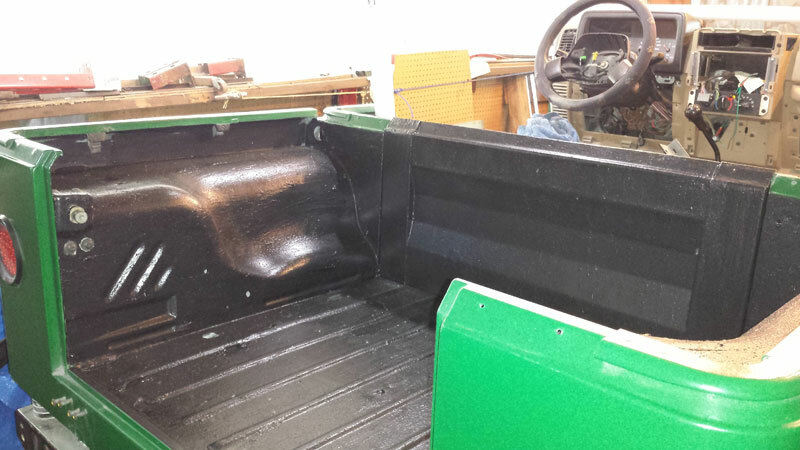 To finish it off I gave the whole console a coat of paint to match the body bring the outside in. Of course there are always challenges and this trim piece needed to be pulled in and out so many times while working out bugs that it got pretty banged up along the way. One day it will need a fresh coat of paint and a few touchups. One of the things that isn’t obvious from that last photo is that the bottom switch is a two position switch to control the auxiliary backup lights I would go on to install in the rear bumper. Being an 18W LED light, those lights are a little overkill for use in town as reverse indicators, but I still wanted them to be automatic reverse lights out of town. To make it work I have a two position switch to control them which allows either to completely kill the lights, to turn the lights on full time as work lights in camp, or to slave them to the transmission to come on whenever I’m in reverse (and turn off when not in reverse so I don’t get pulled over by the police like my father did around the time I installed these for blinding an officer with his backup lights). Actually wiring turned in to an extensive part of this project. I wired up an entirely new fuse and relay panel to run auxiliary lighting and the eventual onboard air compressor. I split the factory wiring harness behind the drivers seat to pass neatly through the new cab wall and sent leads into the dash to trigger things like the backup camera. There’s another fuse panel added behind the glove box to neatly control all the extra power outlets, radios and other neat gizmos in the cab as well as all new wiring for the sound system as the stock speakers were all thrown away in favour of something a little better suited to the job. As well I had to entirely cut off both the front and rear wiring harnesses and rewire the jeeps lighting at both end from scratch. In the rear I had new taillights, auxiliary backup lights, and a strip light over my bumper to comply with legal requirements (third brake light as well as reverse indicator lights that didn’t blind those behind me) all needing to be wired in. As well, I set up all those lights to be easily taped in to with a plug at the top of the box into which I can plug additional lighting mounted to the back of bike racks, overhead roof racks, or anything else I decide to add on. On the front I not only put in my own relays to send full voltage to the headlights (bypassing a known weak spot and boosting my light output) but I set up a series of relays and diodes to convert the factory three wire (park, turn, ground) turn signals into an output for normal, two wire lights. This was a necessity because in doing away with the stock fender I had to come up with a new side facing turn signal. The solution I chose was to mount three penny lights in each fender, out on the edges of the hood. It was a lot of extra effort, but I think the visual result was worth the time. 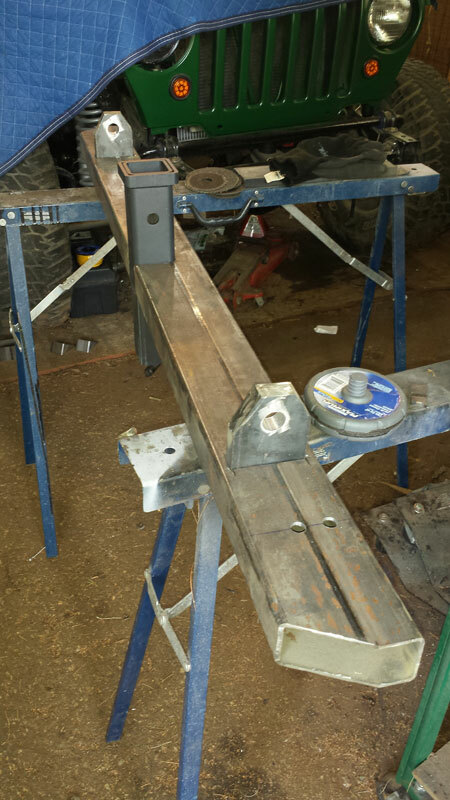 Next up it was time to fabricate some burly bumpers. The rear is built from 1/8″ wall 2×4″ square tubing with a receiver hitch and heavy recover points built right in and aligned with the frame. 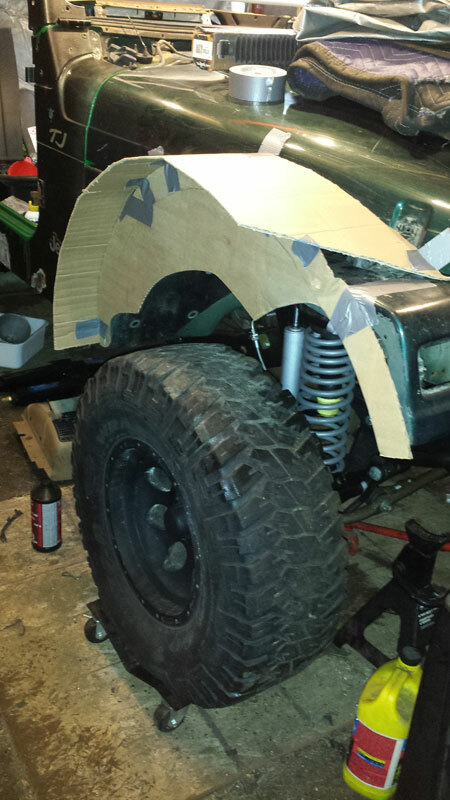 To beef these up even more I added TMR bumper tie in’s to further anchor the bumper to the frame rails. On the front, the stock bumper was reinforced with 1/4″ angle iron again with a receiver mount. 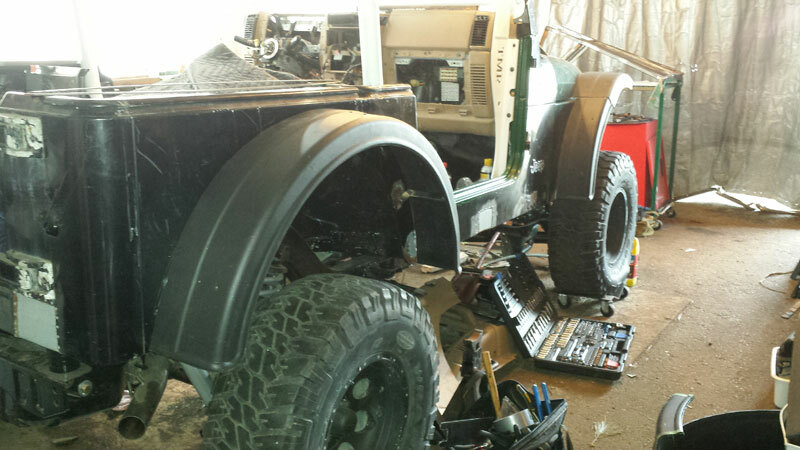 In time, I’ll run wiring and plugs to both the front and rear bumpers to plug in a winch to which is anchored through the receiver mount. The idea there being that not only can one winch be used for either front or rear recovery, but I can keep the weight off the front springs unless I’m in the bush. 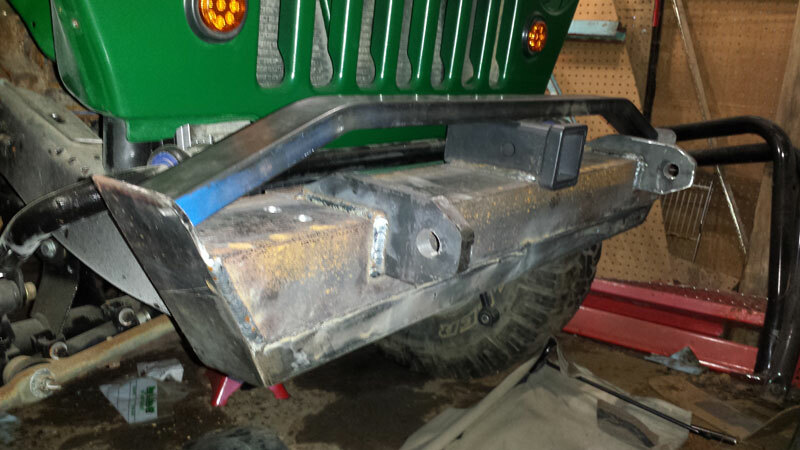 While I was cutting up the stock bumper, I trimmed the edges to allow them to push off rocks and added a light mount for fogs. Getting close to being on the road with the Jeep, I finally tackled one of the projects I was most dreading – modifying the top. All along the build I intended to use a short, pickup style soft top. I wanted a pickup style vehicle, but I still wanted to be able to drop the top on sunny days. Rather than building a custom top completely from scratch, I thought it would be easier to just shorten a factory top. 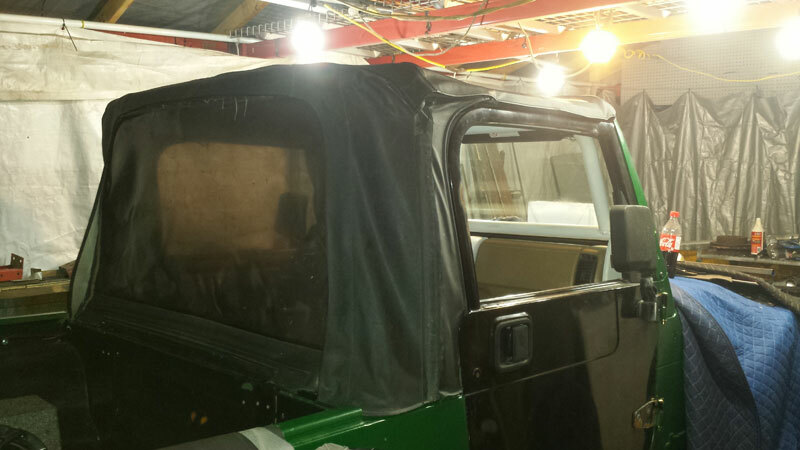 That was why when building out the cab wall I used a set of cab corners from another Jeep tub to match the mounting pattern at the new location. The end result was that my new top would be identical to a full-length, factory top, but with 32″ cut out of the middle of it and sewn back together. Simple to say, much harder to do. Thankfully I was able to enlist some help from my mother in this project, a master seamstress herself, and had a second, backup top available in case the first one got screwed up, as well as a couple ruined top pieces to cut up as rough mockups first. It was a lot of cut and test, cut some more and test again. All those baby steps though meant we got a top built that’s reasonably good on the first pass. It won’t pass for a factory original piece on close observation and I’ll probably build a top from scratch for it eventually, but for now it looks great to a casual observer, and with a few more modifications along the way it is finally water tight. With the top in place and a whole lot of boring but time consuming finish work, I was finally able to drive the Getaway Jeep out on to the street for the first time in 18 months. There was still a laundry list of things to do, but I could start driving it to work out the bugs and retire my Jeep Patriot at long last. The Jeep however had other plans. When I first bought the truck, it already had 330,000km on the odometer and a questionable at best service history. 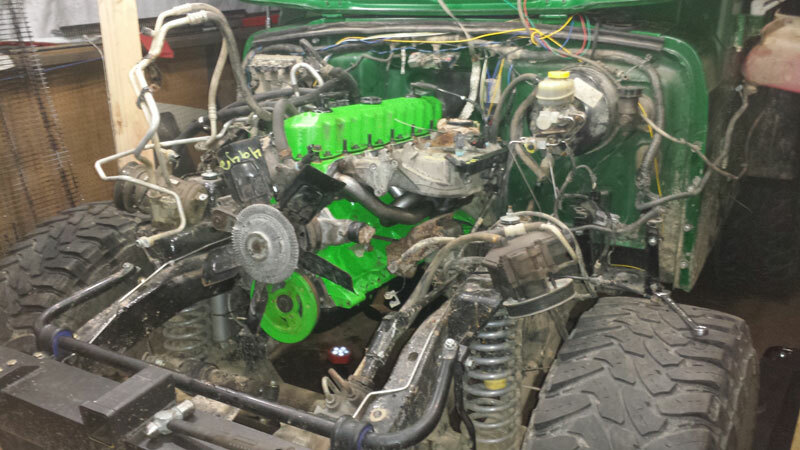 I went over most everything on the truck during the build – but you may have noticed I skipped the powerplant. While the engine sounded good, I wanted to run it a bit before investing more than a couple seals and some fresh oil in to. As it turns out, I was right. With only another 3000km on the engine, it developed a nasty knock. 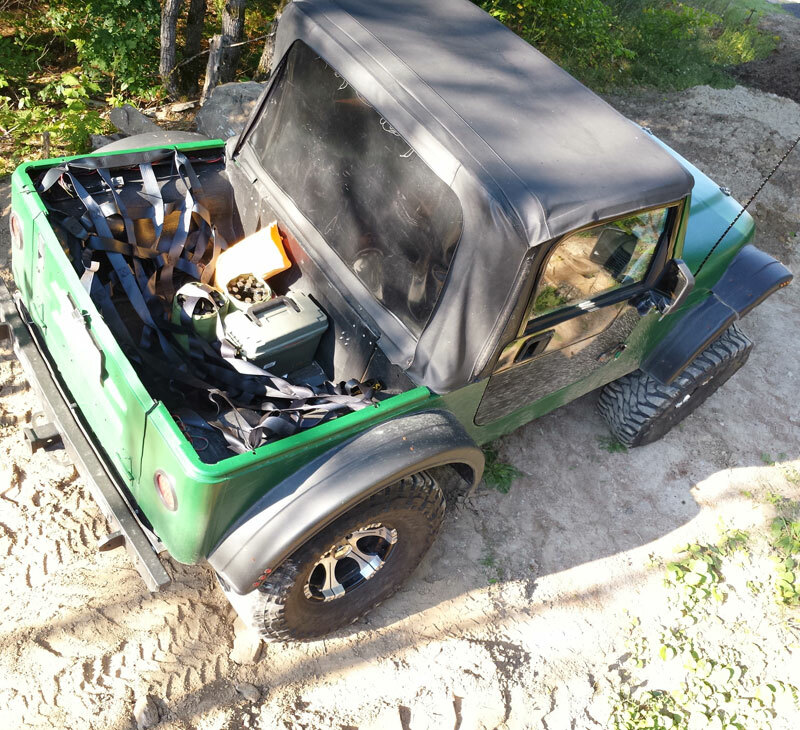 Several mechanics looked at it, most of them Jeep specialists, and they came up with several theories as to what could be causing my knock, but no one was confident enough in their diagnosis to pin point a cause. 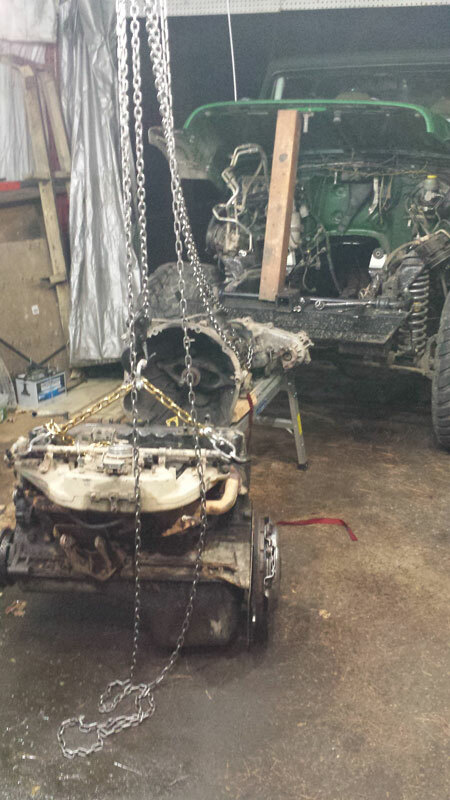 Everyone did agree however that the engine needed a complete rebuild. So here I was in the heart of the summer with a brand new Jeep I couldn’t drive and I went looking for another engine. 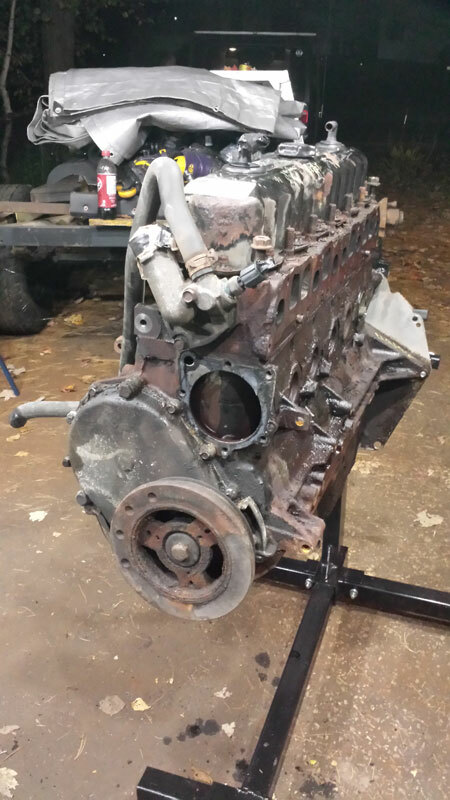 This one got the complete rebuild service, stripped right down, painted, and every gasket and seal replaced and every bolt checked over. Before long, my shiny new Jeep was looking like a junkyard wreck again. But in short order it had a new heart as well as several upgrades along the way. One of the things that still needed to be fixed was that in moving the transmission I had removed the factory skid plate. 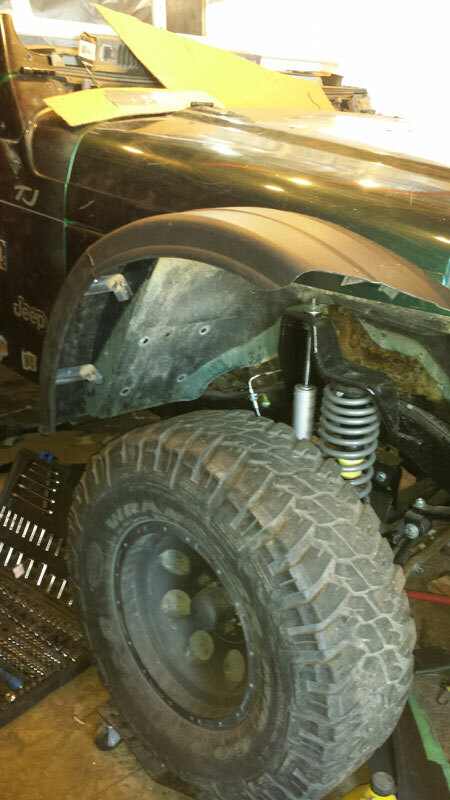 The truck was never intended to be a serious rock crawler and so didn’t need heavy duty protection under there. but I still wanted an extra insurance policy covering my oil pan out on the trail. 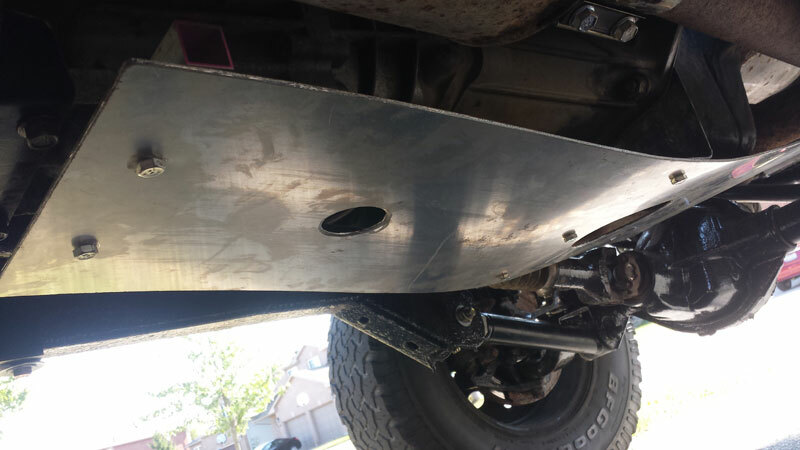 So with a good sheet of aluminium and some ingenuity, I was able to fabricate a new skid plate to protect my oil pan and transmission. But for now, I’m finally driving Oscar out on the streets and through the trails. 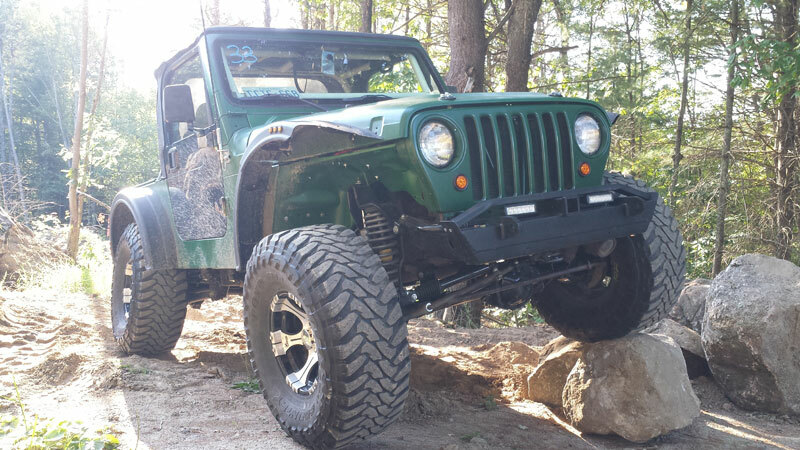 It never fails to draw a crowd at Jeep events and it’s not uncommon to come out to the parking lot to see people looking it over from every angle. There are still a number of things to get done, like the tool boxes and bike racks in the bed and the new spare tire carrier on the bumper, and some of those things are already in the works, but in the mean time the truck has held it’s own on the trails I was able to throw it’s way before winter set in again. It even has been able to tear up the white stuff accessing a remote and unplowed cabin through thigh deep powder. It’s a work in progress, but a hell of a fun one.